10. The Miniature Hamlet, Prince of Denmark. 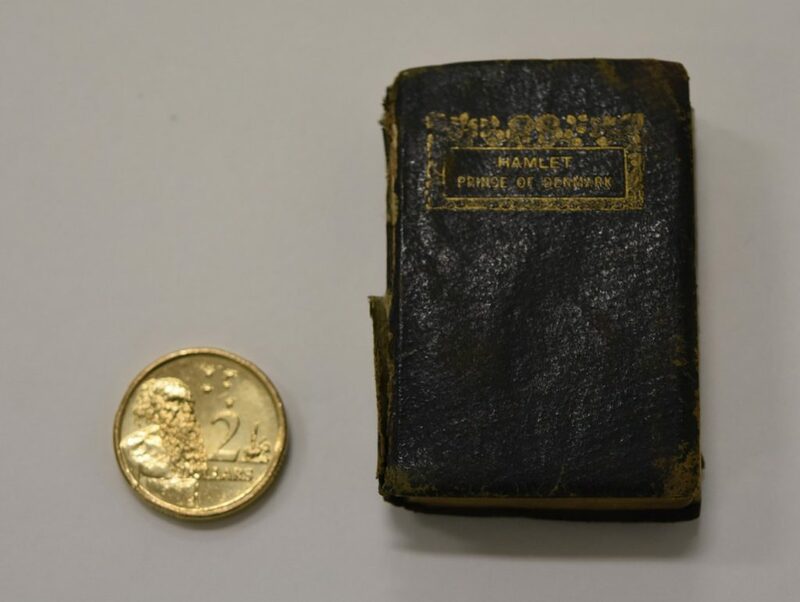 Small, but perfectly formed, this miniature copy of Shakespeare’s Hamlet, Prince of Denmark, is the smallest book in the Curtin Library collections. Measuring 51mm x 36mm, and printed on 508 pages, the font is surprisingly legible, almost, to the naked eye. Miniature books are generally defined as being no larger than 7.5cm or 3 inches in either height, or width. They have been produced from the earliest times of printing. The publisher of this 1904 volume was David Bryce of Glasgow. He developed the use of the photolithograph process to reduce the print image and create small volumes with clear sharp text. This technique combined with the use of thin but opaque India paper enabled the production of very small fine pages of legible print. 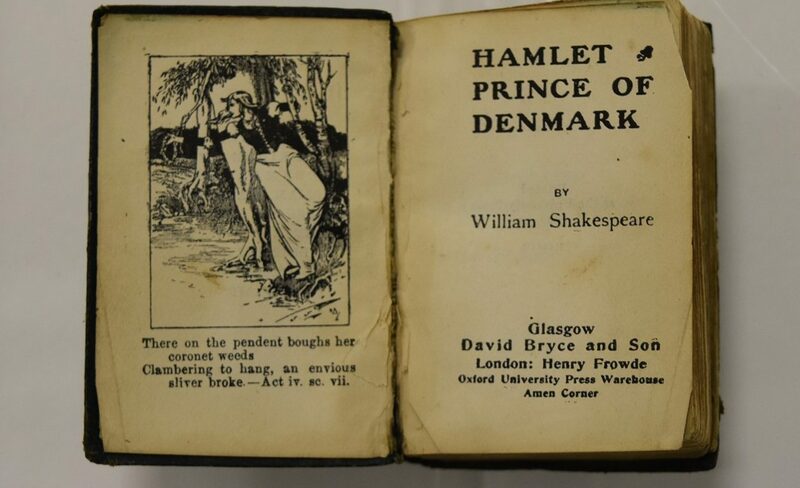 David Bryce became one of the most successful makers of miniature books, publishing over 40 titles in the format, including multiple volume sets of Shakespeare’s works. The Curtin Library holds a number of very small sized books, although no others as small as this little Hamlet. As these may easily be lost in the shelves of the Robertson Library they are stored in the JCPML stacks, where they are available on request for use in the Reading Room. National Library of Scotland holds an almost complete collection of the Bryce miniature books. Lilly Library Indiana University has an extensive collection of over 16,000 miniature books. March 20, 2017 March 14, 2017 John Curtin Prime Ministerial LibraryMiniature. Previous Previous post: 9. Open Razors and a Great Shave. Next Next post: 11. Le Deche di T. Livio Padovano delle historie romane.